Like any American kid, I would whip into a frenzy at the first hint of that tinny, slightly creepy music signaling the ice cream man was on his way down my street. In scenes repeated in neighborhoods across the country, I would run around in circles screaming “Ice Cream Man! Ice Cream Man!” while my mom scrambled for change. Tightly clutching that salvaged quarter, I’d fly out the door and sprint down the street like a track star in an Olympic 4×400. Sometimes I was successful, sometimes not and I’d crumple at the corner (I wasn’t allowed to cross the street), breaking down in hysterical tears as I’d watch him pull farther and farther away. Insanity. Sheer insanity. Luckily I was a speedy little thing and as soon as I caught my breathe, I’d stare at the colorful pictures of frozen novelties letting other kids go first while I took time formulating my selection. Sure, I had my regular rotation – the red, white and blue bomb pops or the awful rock hard artificially flavored sno-cones were perenial favorites – but I could be known to throw in a curveball. Once in a while I’d skip the ice cream and get a Lick-A-Maid, that grotesque candy dipping concoction I adored. And some days a Creamsicle won my favor. 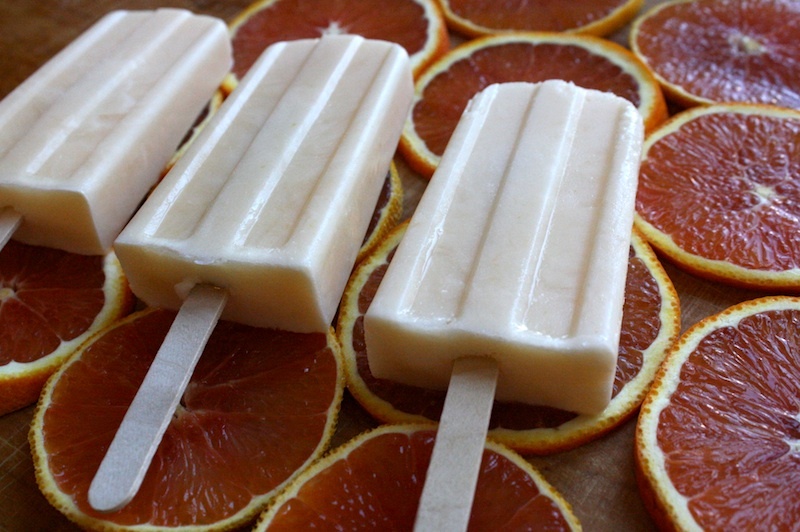 A sweet orange popsicle layer coated and even sweeter creamy vanilla-ish filling. The trick was to eat them quickly before they melted and fell off the sticks on those 120F summer days. They were particularly good on those crazy hot afternoons when we’d challenge each other to see who could stand barefoot on the asphalt the longest. Oh the fun we had. I hadn’t had a creamsicle in years (or a 50/50 bar or a Dreamsicle. These things seem to go by many names). Then this summer I happened upon a real, honest to god ice cream man along the lake. Not a paleta vendor with their bicycle cart and tingling bells or some artisan shaved ice cart with homemade organic syrups but a real old school ice cream truck with the window, the colorful stickers and cranking the very same creepy tinny music I remembered. I stared at it for a while, making sure it wasn’t a heat mirage, before walking up and treating myself to a creamsicle. It was just as good as I remembered and this time I kept my shoes on. I fondly recalled that day last week as I was piling on the winter gear – scarf, hat, boots, wool coat. I needed some sunshine in my life, badly. It was time for a creamsicle so I made some. It’s not entirely the same – there’s no creamy vanilla center – but the flavor is certainly reminiscent of the original. Since citrus is at it’s peak right now, I think it’s just perfect, especially with juice from cara cara oranges or tangerines. Delicious. STRESS THERAPY BAKING FACTOR: SUNSHINE DAY. With a stash of these in the freezer, there’s no insane running around for nickels, digging behind the couch cushions or whipping the whole household into a frenzy. I know how much we’re all looking forward to the dreary days of winter ahead, so I think it’s a really good idea to stock up for those emergency needs. They’re sunshine on a stick and probably my primary source of vitamin C for a while. I really don’t care for bits of zest in these things so I strain it out. The orange flower water can be optional but it really adds a lovely flavor and makes it rather creamsicle-y. Look for it in Middle Eastern markets or even Whole Foods. In a small saucepan, bring the sugar and water to a boil, stirring to dissolve the sugar. Add the orange zest and let infuse, off the heat, for 15-30 minutes. In a medium bowl, strain the simple syrup to remove the zest (discard the zest) then add the remaining ingredients, whisking to combine. Pour the mixture into popsicle molds, insert the sticks and freeze several hours or overnight until firm. To unmold, run hot water on the outside of the molds and ease the popsicles out. Wrap tightly in plastic wrap, place in a larger Ziploc bag and store in the freezer. Alas, I haven’t seen an ice cream truck here in Phoenix in many years. As a kid my favorites were Good Humor toasted almond bars and coconut bars. Unfortunately, they were rather expensive, so I often had to settle for a push-up or a creamsicle. Your recipe looks great. I’ll give it a shot. I remember we usually ran out the front door with no shoes on… and would have to hop from one foot to the other in order not to burn the bottom of our feet off while waiting for our treat. “Shoes on – socks off” – Momma Sku Side note – I loved those Push Up Pops. Mmm.